The Saar-Hunsrück Steig is a Premium Hiking Trail that runs mainly through the Naturpark Saar-Hunsrück and is reputed to be the prettiest and most diverse long-distance trail in Germany. It was opened in 2007 and was voted "Deutschlands Schönster Wanderweg" by readers of Wandermagazin in 2009. Originally, the trail ran from Orscholz in the Saarland through the Naturpark and ended at Idar Oberstein in the Hunsrück. 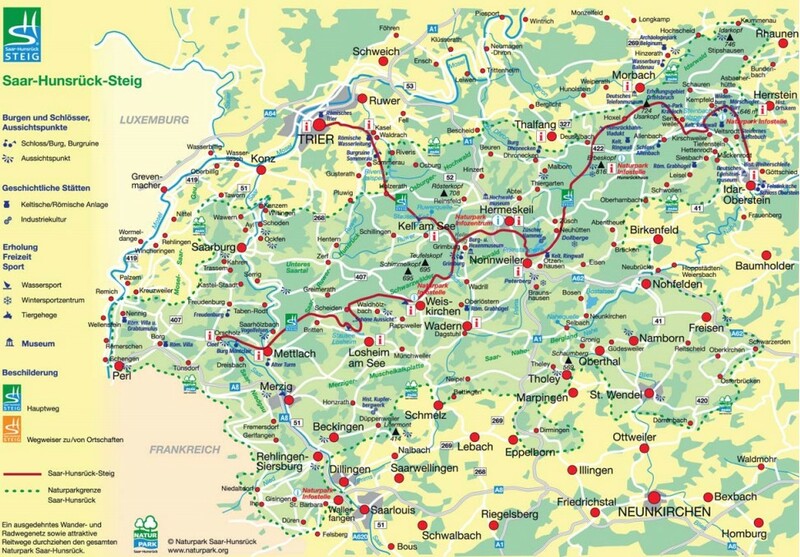 To complicate matters, a section through the Ruwer vineyards from Grimburg to Trier was included, resulting in a "Y"-shaped trail with 3 start/end points. In 2012, the trailhead was also extended another 28Km from Orscholz to Perl on the Mosel river, next to the border with Luxembourg. Now the trail length totals 218Km of which only 5% is on paved roads and more than 70% is on natural paths. These statistics appealed to me as I detest walking along tarmac roads. 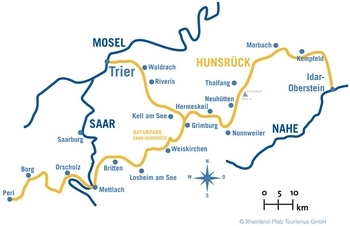 In 2015, the trail will be extended another 190Km with 12 additional stages from Idar Oberstein to Boppard on the Rhein. Prior to the extension to Boppard, the official website recommended 15 stages to walk the complete trail (12 if missing out the leg to Trier). As well as the trail itself, one can also walk some 74 Traumschleifen (circular "Dream Loops"), either on or near the trail. This will increase to 99 Traumschleifen when the trail is extended to Boppard. The Dream Loops are between 6 and 18 km long and are mainly set up as circular routes. Some of them are directly accessible from the Saar-Hunsrück Climb; others are located not far away. So by including all the dream loops, one could feasibly spend a complete summer exploring the trails of this area. Of course, I could not contemplate spending this much time walking about Germany. Well, actually I could, but my wife would definitely object, so the thought was dismissed quickly. To assist in finding hotels, restaurants, bars, cash dispensers etc. I rely heavily on the Meinestadt Portal, which shows all Points of Interest of all towns in Germany. One just has to enter the town name, select which facilities are required, then study the detailed map. For bus travel, the Suchseite für Haltestellen website is invaluable. This excellent website allows one to find any bus stop in Germany by name and town and shows the timetables of all buses that use the selected bus stop as well as displaying the exact location of the bus stop on a map. After securing accommodation, my final task was to organize travel to the area. The trail is not far from Frankfurt-Hahn Airport and flights there from Stansted are available at inconvenient times with the dreadful Ryanair. Fortunately, the trailhead can also be easily reached from Luxembourg. Both LuxAir and Air France provide regular flights from London City Airport and the start point at Orscholz is only an hour's bus ride from Luxembourg Airport. A pleasant alternative, described on the excellent "Man in Seat 61" website, is to take the Eurostar to Brussels and change onto an InterCity Express to Luxembourg. As well as being more leisurely than flying, this was also found to be a cheaper option. Being retired, I have no time constraints, so decided to "let the train take the strain". Following the Seat61 bloke's advice, I booked the Eurostar ticket to "any station in Belgium" (in my case, Arlon) 120 days before travelling at a cost of £79. A month before my trip, I bought a round-trip ticket from Arlon to Luxembourg from the SNCB website. Trip Report from "Wandern mit Tex"